Welcome To EIS South Africa - About Us. 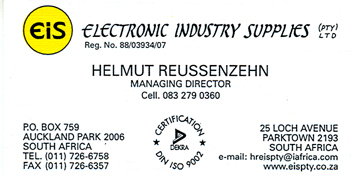 Specializing in the sales of electronic/electrical components & related material. EIS has been in existence since 12 July, 1988 and in that time has moved from strength to strength. 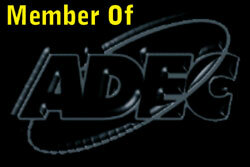 The main trust of our Business is the supplying of imported electronic and electrical components and related materials. EIS has established a reputation of such reliability and high quality that Siemens has given us the go-ahead to ship to stock, without prior inspection. We also have earned their trust and respect with our constantly excellent service. A further indication of the EIS exceptional standards is the fact that we are the proud recipients of the ISO 9002 certificate. The components that we supply are brought in from Germany, England, Belgium, Switzerland, USA, Japan and Hong Kong. We attend, at least once a year, an exhibition in Germany called Electronica and Productronica which alternate each year and which enable us to keep up to date with continually changing technology. "We rate customer satisfaction as our most prominent and important objective." All Content ©2019 EIS, All Rights Reserved.